Brian Cullen interviews Patrick Jackson in another instalment of Writer's Point. Subtitled "The Un-lonely life of a textbook writer", Cullen and Jackson discuss how technology has changed how writers interface with others in the collaborative process. Cullen's interview is a part of a series that investigate various aspects of materials writing from the point-of-view of the author. This issue of Between the Keys sees two more series beginning. Jim Smiley presents a series of interviews with the smaller publishers that have a keen interest in Japan. The first is with Fine Line Press, a small publishing house based in New Zealand that focuses on Japan. The other first is a project that aims to survey the theory of materials development from base principles to specific topics that face writers. Written by various authors, in these pages we present the project overview in which the topics of educational philosophy, educational value systems, pedagogic choice and the editing process are outlined. At the JALT National Conference last November, James Winward-Stuart put together our forum in which the panel gave their views on the future of the publishing industry. Here, Colin Bethel of OUP presents a little blurb on OUP's stance, and David Dolan shares his "Thoughts on Digital Publishing". Last September, our SIG cosponsored two JALT chapter events, one in Akita and the other in Morioka. We sent Cameron Romney (now our hallowed leader!) up north, and he presented on typography and design. He has provided us with a report from these meetings. Jim Smiley ends the issue with a look at the role of typeface in educational design. at the JALT EBM. She is the current co-ordinator of the JALT SIG Gender Awareness in Language Education. 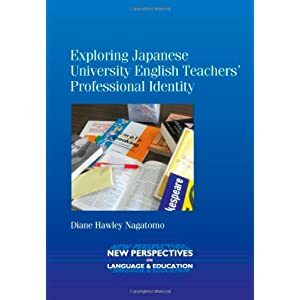 Diane showed me her latest book, Exploring Japanese University English Teachers’ Professional Identity, which is based on her Ph.D. studies. I could see the book for only a few short minutes, but it is clearly a much-needed addition to the bookshelf of the university professor interested in self-identity. I'll be getting a copy when the next round of research budgets are ready in April.